It’s Saturday chat day! For those of you who have read Omega Dragon, this is your chance to talk about it. Ask questions, make comments, or even chat among yourselves about this final book in the Dragons in our Midst story world. If you post something about Omega Dragon that includes spoilers, please begin with ***Omega Dragon Spoiler Warning***. That will help those who have not read the book avoid spoilers. I will give them another chance to talk about in next month. Little known fact about Omega Dragon: When I first signed a contract for this book more than five years ago, the publisher needed a title to put on the contract. I had no idea what the story would be about, so I made up a temporary title – The Eighth Ovulum. I just got my copy yesterday so I’ll have to wait to comment. I was wondering though, since you write “by the seat of your pants,” how far advanced were you before the first books of the different series were published? When Raising Dragons, Eye of the Oracle, Starlighter, and Beyond Reflection’s Edge came out how far had you written of the next books? When Raising Dragons came out, I had already written The Candlestone, and I was just beginning Circles of Seven. When Eye of the Oracle came out, I had started Enoch’s Ghost, but the story wasn’t working well, so it took quite a while to finish it. When Starlighter came out, I had already finished Warrior, mainly because that publisher always takes a long time to publish a book after I turn it in, so I had plenty of time. The same is true regarding Beyond the Reflection’s Edge and the second book, Eternity’s Edge. I’m not sure, however, if that answers your question, because I don’t see the relationship between my answer and the fact that I am a seat-of-the-pants writer. It does :). I was wondering that because since you said you sit down and write if there were things you wanted/could change based on the way the story continued to develop. I have not wanted to go back to change any story issues, though I have wanted to improve the writing sometimes. 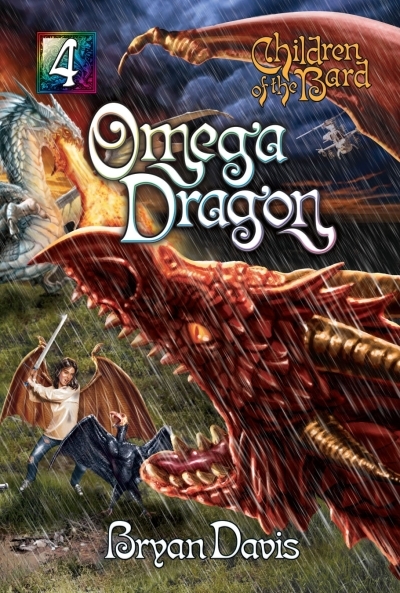 Ok, so I just finished Omega Dragon last night, and it was sooo good and I cried so much!! But I have a few questions I’m hoping you can answer! 1) When Lauren slept to try to talk to Matt, what exactly happen there? Tamiel was the one talking to Matt, so what happened to Lauren? Why wasn’t she able to talk to him? 2) Who was riding Dikaios? It seemed to me like it should have been Jesus or someone like that, but I had no clue. 3) What happened to Earth? Obviously, the rapture did not take place, because all of the survivors would have gone to Heaven instead of Second Eden. But why did all the portals close? What happened to Satan? He’s supposed to be thrown into the lake of fire, not a bottomless pit. 4) Why is Abaddon working for God? We actually encountered him in family devos a few nights ago, and my dad said he works for Satan. I think that’s all. Thank you so much for writing this series, it is my all time favorite and has helped me grow in my faith so much!! You are such an inspiration to me and I am so thankful to have discovered your books!! I’m glad you enjoyed the books. I don’t remember a scene such as you described. Please provide a page number range. It was Jesus riding Dikaios. I don’t know what happened to Earth. The characters left before that was revealed. The portals closed, because God didn’t want any more travel between the two realms. Satan (Arramos) was cast into the abyss, as told about in Revelation.20:1-3. Where does the Bible say that Abaddon works for Satan? First, I’d like to apologize for the delay of my reply, I had to work today. That is chapter 20, Dream Oracles, page 333-353. I read the passage in Revelation, and now it makes much more sense, but isn’t that supposed to be the 1000 year reign? I realize that you have decided to leave what happens on Earth unvisited, so maybe it’s pointless to try to reconcile certain events of the book with the timeline of the endtimes/rapture, which I have been rather fruitlessly trying to do. The main thing that is bothering me is the locusts, which were unleashed in The Seventh Door, but aren’t they not supposed to be released until after the rapture? Again, I’m probably just over-analyzing this, since we don’t know what happened to Earth. Please don’t feel the need to try to explain anything if you would rather not. I talked to my dad, and we did a bit of research, and we haven’t been able to come up with anything specific, that was just my dad’s opinion. According to the Macarthur study Bible, Abaddon is either one of Satan’s most trusted leaders or even Satan himself, in a footnote of Revelation 9:11. Most of the books and resources we have on Revelation seem to believe that Abaddon is evil, but the Bible never specifically states one way or the other. Yes, the casting into the abyss is the precursor to the 1000 year reign, but the characters left Earth, so the story doesn’t go into the events thereafter. Whether or not the locusts are released before or after the rapture is a matter of interpretation. I don’t believe in a pre-tribulation rapture. I realize that many disagree with me on that. I think this angel with the key of the abyss is the “angel of the abyss” from Revelation 9:11, which is Abaddon. So that’s why I had Abaddon throwing Arramos into the abyss. It seems reasonable to me that the angel of the abyss would have the key to the abyss. When Lauren slept to try to talk to Matt, what exactly happen there? Tamiel was the one talking to Matt, so what happened to Lauren? Why wasn’t she able to talk to him? When Matt awakened, the real Lauren is gone, because Matt is no longer dreaming. The “Lauren” he sees no longer has white hair. That is the reader’s clue (along with Lauren’s call “He’s coming!”) that this isn’t really Lauren. It is Tamiel disguised as Lauren. Since Tamiel killed Lauren, he is able to disguise himself, but he disguises himself as he thinks Matt would remember her, with darker hair. Eagle knows that this Lauren is fake, so he shoots her, which, of course, angers Matt, because he is confused, as can be expected. I hope that clears things up. If not, please ask further questions. Thank you, that does clear things up! I didn’t realize where Matt’s dream ended, so I thought it was Tamiel the whole time. Omega Dragon Spoiler Warning, maybe I’m really glad how everything in this book turned out. I love what you did with Lauren, and Clefspeare was awesome! I loved Bonnie’s goodbye speech to Carly, it was so sweet. I also liked how everyone sort of got together in the end and how everyone was either pregnant, married, engaged, or something like that in the end. Maybe one of my top favorites was how I got to meet all of my friends from the entire story arc in the epilogue and relive all of our favorite moments. I also loved how I got to meet my favorite character Shiloh again. I really loved Omega Dragon, it was really good, but I have a couple questions. 1. When all the dragons were coming to greet Billy and Bonnie, you didn’t mention Patrick/Valcor or Karrick, or any of Hannah/Thigocia’s other children. Where were they? And by the way, the thing with Hipprocrates/Dr. Conner and Fidelia/Marylin was totally shocking and very cool! I mentioned Patrick in the last chapter, but he did not appear in his dragon form. Karrick is alive and well in Second Eden. Not all of the dragons gathered in that spot at the end. It would have been too crowded. I’m glad you liked what happened to Dr. Conner and Marilyn. I just finished the Tales of Starlight and Dragons of Starlight series, and I was wondering: can the disease be carried? Because even though some characters are immune, wouldn’t the contagion still be on their clothes, etc.? By the way, I loved the way you wove the two storylines together! I read it in the order you suggested, alternating between the two, and I’m glad I did 🙂 I thought the end was very satisfying, too. It has been a while since I was in that story world, but I seem to remember that there was concern that one person could expose another to the disease, maybe due to the clothing issue you mentioned. I would have to go back and research to be sure. I’m giving a persuasive speech in school on why people should read fantasy books. Do you have any suggestions? Like, if someone told you that they didn’t like fantasy, what would you say? If someone simply doesn’t like fantasy, I usually don’t say anything. Tastes differ. But if someone opposes fantasy on moral or religious grounds, then I often do respond. If after reading these you have more questions, let me know. I haven’t received my copy of Omega Dragon yet, so I can’t ask/comment on it. I do have a question, however-what made you want to write? The story starts about 20 years ago. My children were in homeschool, and they weren’t interested in writing, so I began writing a story with them in order to get them interested. The process created a passion in me to write, so I began my writing journey. First of all I love Omega Dragon!!! I cried when Sapphira and Elem died. It was such a tragic and beautiful death. I loved the ending! It was the perfect conclusion to an amazing series! Now for a non-Omega Dragon question. Concerning your May trivia contest, you said you would probably post the questions early. I’m just wondering if you’ve taken into consideration time difference? 7:00 am on the East coast is 4 am on the west coast. So the East coast has an unfair advantage if you post them very early. I’m just wondering if that comes in to play at all or if its just first come first serve. Someone else asked about that, and I am reconsidering how to do this. I might decide to post at random times, including times that would be later for east coast people and just right for west coast people. That should give everyone equal chances. Some people have school as well and would not be able to answer questions during those hours. Since this is the end of the series, and it did end amazingly well, do you foresee a time in the future where you may continue a new story in the same storyline or universe, or is this end of the stories that will come from it? I have no desire to write any more novels in this story world, but I think it’s unwise to completely shut and lock the door on the possibility. You never know how God might lead. But don’t take this answer as opening the door. It is not. Right now, I really want the story world to be finished with regard to novels. A short “missing chapter” story is a more realistic possibility, though even that would be well into the future. Thank you for the very wise answer, as well as ensuring hopes don’t get raised. I appreciate the honesty. Also, as a side night I read all your daughters books the other night at work, and she is an amazing author, I could see a lot of your influence in her writing, and she has made my short list of some of my favorite authors. Thank you, and this question may be a little of topic, but were you partially responsible for me receiving a t-shirt today for dragons in our midst? On Facebook you said that there was someone who wasn’t at the wedding at the end of the bones of makaidos and that we’d find out why in omega Dragon was that Merlin since he was guarding the pool? You are correct. Merlin was not at the wedding because of his assignment at the life reservoir. I get names from a number of sources. Some just pop into my head. Others I get from baby name websites where I search for names with appropriate meanings. Google translate isn’t always accurate. Did it sound reasonable? Definitely. Made sense to me. I could tell you the results if you would like. Joan: I waited a long time for my resurrection; for my return to combat. Why now? Abaddon: Because war is upon us. Your resurrection and your fight will not be what you expect. Lauren needs only a companion, not a warrior. That’s pretty good as a translation. Congrats! I was the one who did the translation for that. :D:D Tell me the results as well. And tell me what’s written in the book. Joan: J’ai attendue longtemps pour ma resurrection, pour mon retour au combat. Pourquoi maintenant? Abaddon: Parce que la guerre est sur nous. Votre resurrection et votre combat ne sera pas ce que vous attendez. Lauren a besoins seulement d’une compagne, pas une guerriere. My translations are in a separate comment. I am of a divided mind on this post. I have yet to purchase my own copy, and I was practically tearing my hair out waiting to find out what happens in certain scenarios/to certain characters in the story. I still don’t have the whole story, obviously, but my madness has now been stayed. Hoorah. On the other hand, I now know information out of context, and that leaves an all new kind of insanity in its wake. Okay, I know that I am a few days late for this, but I just finished Omega Dragon at like midnight last night. into the new series in the first place, so that the readers could see how much both of them, (especially Adam) have changed since the beginning of the series. 2.When Elam and Sapphira died, I nearly started bawling. We have been with them for so long, in some senses longer than any of the others, and that made it the hardest for me. I have to admit, when Lauren was told that there had to be two sacrifices, I knew almost immediately that Elam and Sapphira would be the ones to volunteer. Both of them have always just had such hearts of willingness and sacrifice. 3.When Tamiel disguised himself as Valiant, I wanted so bad to be able to warn Matt and Listener!!! I knew it was really Tamiel from the beginning. Even though you already knew that Tamiel could disguise himself as someone he had killed, even if I hadn’t known that, I thing that I could have guessed. Something just didn’t seem right about him. For sure when he let Listener lead the way, I knew it wasn’t him. The real Valiant wouldn’t have done that. Finally, I really do love how you ended the series. I haven’t been reading them as long as some (going on 3 years, I think) But I feel as though I have been reading them my entire life. I really enjoyed how, in the end, you go to see a glimpse into their new lives. Ashley and Walter are finally going to have a baby!! Yay! and I love how they reminisced about past adventures. Oh, and Walter has his sense of humor back. 🙂 I mean, it was never completely lost, but was definitely hiding for the last 15 years. Now it’s back front and center. I finished it last week. IT WAS SO GOOD!! I almost ripped myself apart because all my schoolwork kept me too busy to read it until summer (homeschooled 🙂 which started last week, and now I read it, and it was AMAZING!!! Mr. Davis, you have truly outdone yourself. Thank you for such an amazing series. I’m so sad that it has come to an end. I have a few questions concerning the series as a whole… they’re pretty trivial, but I can’t resist asking. What color are Listener’s eyes? In Enoch’s Ghost, you introduced her as having blue eyes, but then in The Seventh Door you said something about her beautiful reddish-brown eyes. I’m confused. What’s the deal with Jared’s faith? The books imply that he was an atheist. For example, at the beginning of Raising Dragons, it says that Marilyn would sometimes give Billy lessons from the Bible when his dad was away, implying that Jared would not approve. Then later, when they were in the plane, Bonnie commented on the crates of Bibles in the back of the plane and said, “Oh, so you do follow the Bible. My mother told me that you didn’t.” Then it said Jared’s face turned red and he changed the subject. What gives???? It’s never resolved, at least that I can remember. Again, thank you for an amazing series and GROUND SHAKING conclusion. I loved the relationship that developed between Matt and Listener! And it was too cool when we figured out that Jillian had dragon wings. I love Lauren’s character, and her transformation to an Oracle of Fire. I will say, though, I still will not accept that you changed Bonnie’s beautiful blonde hair to black! I just gave myself psychological therapy until I had completely annihilated that mental image. Now I can still imagine her as blonde. Now I have a question for you, Mr. Davis: do you ever speak at homeschool conventions? I live in Texas, and I was hoping that maybe one year you would be at our state-wide convention to speak and sell books. That’s it!! 🙂 Thank you so much again! God has used you in unimaginable ways and I am so thankful. May the Lord reward you. I’m glad you enjoyed Omega Dragon. Thank you for your kind words. I haven’t figured out yet why Listener’s eye color changed. Maybe it had something to do with the loss of one of her companions. After it was taken, maybe her eyes slowly changed color over time. I’m not sure. Jared had no real faith in the true God until he went to Dragons’ Rest. He learned the truth there and passed through the covenant veil. Bonnie never had blonde hair. In her youth, she was described as having light brown hair with blonde highlights. Her hair darkened when they did experiments on her (Song of the Ovulum), but it never turned black. I do speak at homeschool conventions. If you have any pull in getting me into your convention, I would be glad to look into it.